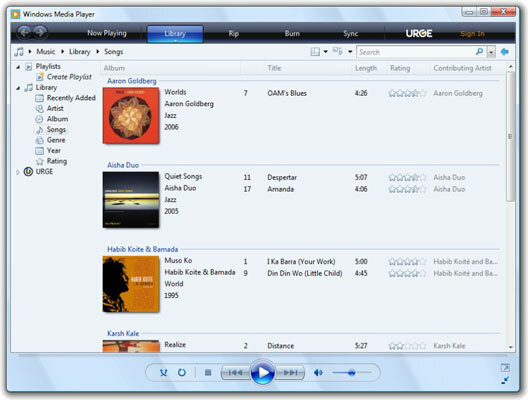 The first time you run Windows Media Player, you need to take a couple of minutes to get things started on the right foot. 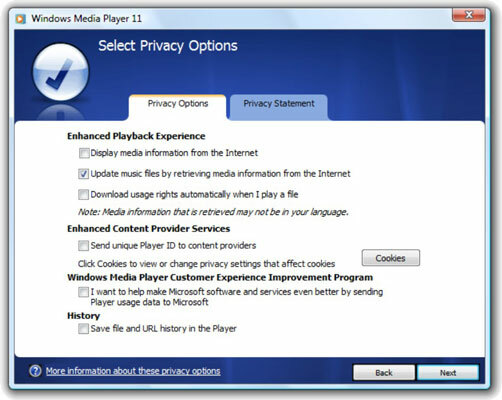 By following these steps, you can ensure that you set up Windows Media Player in Windows Vista while still protecting your privacy. Choose Start→All Programs→Windows Media Player. The Windows Media Player setup wizard appears. Note that we’re working with Windows Media Player here, not Windows Media Center (which is more widely focused on video, TV, and the “10- foot interface” that works well with a TV remote). Select the Custom Settings option and click Next. The Privacy Options dialog box appears. Check the boxes you really want to use, and click the Next button. Many of the WMP options either slow down your media enjoyment or share a surprising amount of personally identifiable information with the people in Redmond. Microsoft actually lost a court case over a couple of these options and now cannot have them activated by default. The safest bet is to match the selections shown in the preceding figure: Only Update Music Files by Retrieving Media Information from the Internet is enabled. And if you don’t have an always-on Internet connection, you don’t even need that. WMP asks whether you want to add a shortcut to the desktop and/or the Quick Launch toolbar. Check the box to add an icon to the Quick Launch toolbar; then click the Next button. WMP asks whether it should be associated with the filename extensions for a couple dozen audio and video file types — every extension that WMP understands. 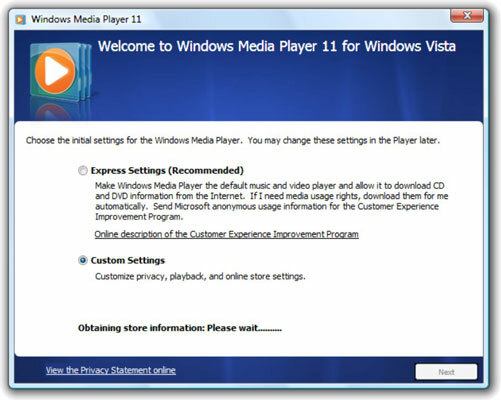 Select the Make Windows Media Player 11 the Default Music and Video Player option and click Next. Unless you plan to use more than one media library, let WMP take control of all the audio and video filename extensions; you can selectively reassign individual extensions to specific programs by hand later. 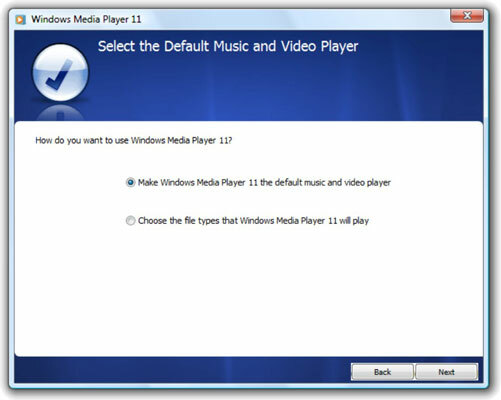 If you don’t feel comfortable with that approach, select the Choose the File Types That Windows Media Player 11 Will Play option and click Next. At that point, you can manually sift through a couple dozen filename extensions. For example, you might want to assign MP3 files to Winamp or MPG files to WinVideo. Select whether you want to let WMP create an online store for you. This is where Microsoft gives you the “opportunity” to spend half an hour setting up an online account with URGE, so you can spend more money later. Most likely, you’ll want to select the Don’t Set Up a Store Now option and Finish. You can open an online account later. 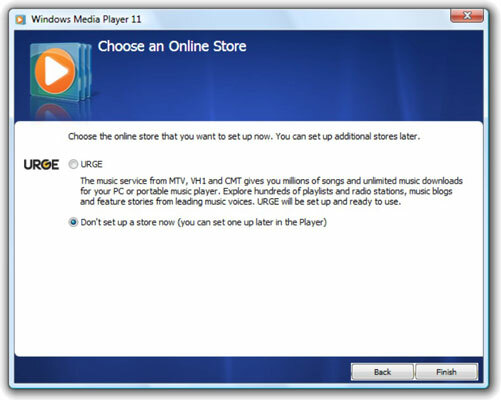 If you don’t choose to set up URGE, Windows Media Player appears rather quickly. It scans the preordained disk locations for music and video files and presents them to you in the WMP Library, as shown in the following figure.